If you love styling your hair, chances are you use hairspray every now and then. We all know how annoying that stuff can be as it gets glued everywhere. Hence, it has to be used cautiously. When stuck to the wall, it is important that you clean it right away. This will also help you in the future if you ever plan on repainting your walls because the colour will fade away if the hairspray is not removed. You can also try testing the spray on a small area in your bathroom to see if the spray stains or fades away the colour of the wall. There are three methods that you can use to remove hairspray from painted walls. Using Shampoo: If shampoo can wash all the hairspray from your hair, it is obvious that it can clean the spray on other surfaces too. In this case, it is better to use a cheap shampoo with minimal or no moisturizing power as they are made up of detergents mainly. Take a spray can and fill it with warm water. Add one tablespoon of shampoo from any low-end brands and shake it. Spray it on the wall and cleanse it with a microfiber cloth working from the bottom to prevent drip marks. Using steam: Steam cleaners are very effective on cleaning hairspray from walls. However, use a microfiber cloth to remove any remainder after using the steam cleaning tool. It also helps to cleanse any other spots or blemishes present on the wall leaving it clean and pristine. Using fabric softener: Add one section of fabric softener followed by two sections of warm water in a spray bottle. Fog the walls softly with the spray and use a microfiber cloth to cleanse it from the bottom. 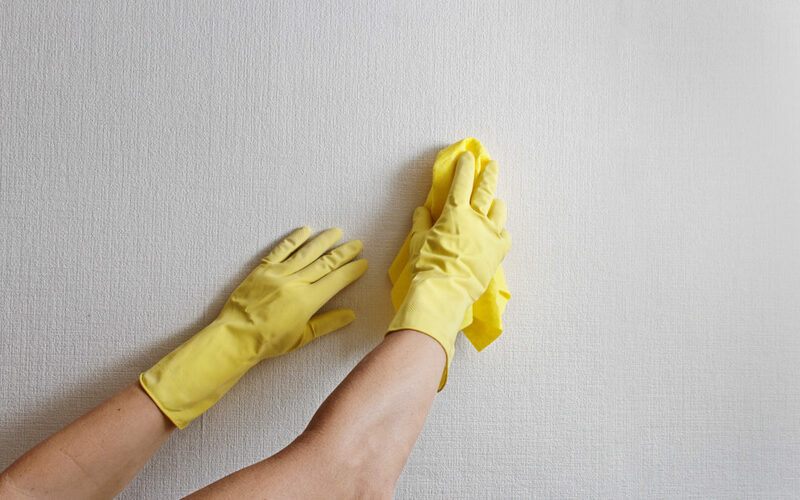 Use a damp cloth afterward to clean any residues of the cleanser present on the wall. You can remove the hairspray from papered walls by using any of the three techniques listed below. Using baking soda: In this case, prepare a paste of baking soda followed by water and apply it to the wall. Take a microfiber cloth soaked in hot water to clean the whole area. It is better to test the paste on a small area on the wall before attempting the whole process because baking soda is a corrosive substance. Using a magic eraser: Magic erasers can be used to clean hairspray along with a wide range of other components. All you have to do is make the eraser wet and daintily rub on the spot. Wrap up by wiping the area with a wet cloth and do not forget to test this on a small area before following the procedure. Using rubbing alcohol: Pour equal amounts of rubbing alcohol and warm water in a spray can and spray it on the affected areas. It is close to impossible to protect the walls from being affected by the use of hairsprays. However, stepping into the shower might help in certain cases but there is no sure way of preventing this.